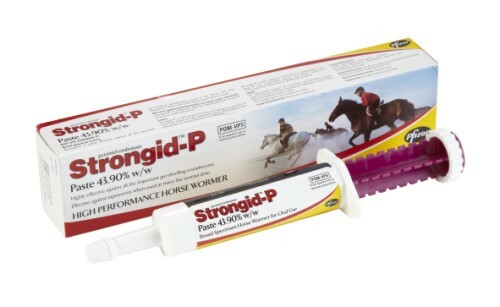 A broad spectrum general wormer, Strongid uses the active ingredient Pyrantel Embonate to destroy and control adult large and small Strongyles, Oxyuris. Parascaris and Anoplocephala Perfoliata. Double dose for Tapeworms. Particularly useful on worms with Benzimidazole resistance. Suitable for all equids, including foals over 4 weeks of age. Easy to administer paste. Below are some recent questions we've received regarding Strongid P Horse and Donkey Wormer, including answers from our team. How do I worm a lactating mare with a one month old foal with Strongid-P? Do both mare and foal get a dose each or if I give the mare a dose, will the foal receive some through the mare's milk? You will need to dose the mare and foal separately according to their bodyweight. It is safe to give foals Strongid P from 4 weeks of age. A Pyrantel based wormer such as Strongid P or Pyratape P is the best thing to use so you are doing the right thing. I would double dose with either one of these at 2 weekly intervals until you have eradicated the pinworm. Cleaning around her bottom daily will remove eggs laid by the adult worms overnight. You could also speak to your vet about an ivermectin and propylene glycol wash to apply around the bottom also. Which is the most effective wormer against threadworm? If you mean the neck threadworm (Onchocerca spp.) then Eqvalan is licensed to treat them and would be the usual choice. It is also theoretically helpful to try and reduce midges biting your horse, as they are responsible for transmitting this parasite. Good fly repellents based on a high concentration of DEET are probably the best. NAF Off DEET Power is a good example.